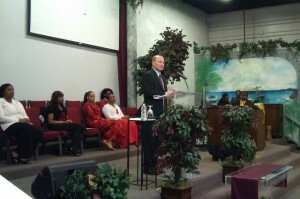 (February 8, 2012) – California State University Chancellor Charles B. Reed, trustees, and campus presidents are among the group of officials who will speak at Super Sunday events held at more than 100 predominantly African American churches throughout the state in February, celebrating Black History Month. 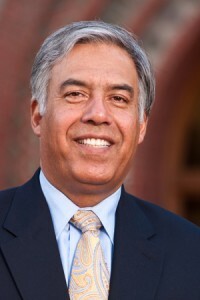 SJSU President Mo Qayoumi spoke Feb. 12 at Antioch Baptist Church. Just a few blocks north of campus, Antioch is among the oldest African American churches in the South Bay. The church’s congregation included the first African American woman to graduate from SJSU. Lucy Turner Johnson completed her degree in 1907. Top SJSU administrators will speak at a total of six churches this and next weekend as part of the CSU Super Sunday program. Details are provided below. Reed spoke during the 10 a.m. service at Crenshaw Christian Center in Los Angeles on Feb. 12. On Feb. 19, Reed will take to the pulpit during the 10:30 a.m. service at Family Bible Fellowship in Newark. The events, reaching more than 100,000 churchgoers, are part of CSU’s outreach to educate students and families about the requirements to successfully enter college and obtain a degree. Participants also receive information about financial aid and the CSUMentor.edu web site that provides the tools to plan and apply to a CSU campus. After the church service, parents and students will have the opportunity to talk to CSU representatives and receive a How To Get To College poster — a practical guide about how to prepare for college. The guide, available in several languages, in print and electronic form, provides the list of classes that students need to take from sixth grade to twelfth grade to qualify for admission to the CSU. It also provides tips for parents and mentors to help students succeed. The annual Super Sunday event is produced by the CSU African American Initiative — a partnership between CSU campuses and African American religious leaders with the goal of increasing college going rates among African American students. The initiative is led by Chancellor Reed and engages CSU trustees, campus presidents, executives and staff. Matthew Jenkins, a member of the California State University Foundation Board, has additionally created scholarships for students attending churches participating in the CSU African American Initiative. Interested students will apply through designated church scholarship offices. Efforts of the initiative are paying off, as more African American students prepare for and apply to the CSU. During the months of October and November 2011, the CSU received 16,588 applications from individuals self-identifying as African American. This is an increase of nearly 1,000 from the prior year. For more information about the list of participating churches, times of service and locations, go to the Super Sunday website. Visit the CSU External Relations website to learn more about the CSU African American Initiative and other community initiatives and partnerships to address college access for underserved communities. Interim President Don Kassing speaking to the congregation at Maranatha Christian Center. 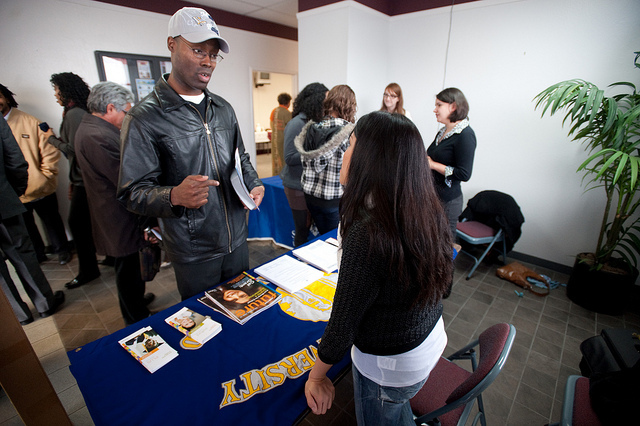 SJSU Interim President Don W. Kassing visited Maranatha Christian Center Feb. 13 for CSU Super Sunday, an outreach program seeking to connect the CSU with African American churches to open a dialogue about what it takes to get into college. Kassing was welcomed with open arms, and enjoyed a lively and energetic service. He also spoke to the congregation about the importance of investing in our youth. Kassing also attended Emmanuel Baptist Church, while Vice President for Student Affairs Jason Laker visited Bible Way Christian Center. After the services, SJSU outreach staff members spoke one-on-one with church goers to answer questions and distribute materials. Tirus Ashford of San Jose asks questions about transfering to SJSU from community college at Super Sunday 2010.